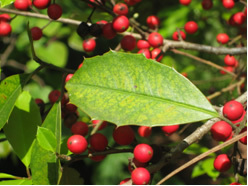 During the cooler months, from November until March, the Southern Red Mite (Oligonychus ilicis) can be a devastating pest of common landscape plants. 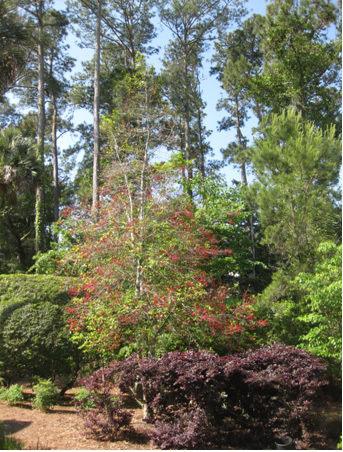 It prefers broadleaf evergreens like Hollies, Azaleas, Magnolias and Camellias- all of which are favorite plants in Charleston gardens. When infestations become severe, they can damage these plants and cause leaf discoloration, leaf drop and dieback. This mite is tiny and cannot be easily seen without the aid of magnification. Therefore, this pest often goes undetected until after damage occurs. The damage is most obvious on Japanese Camellias and it usually makes an unwelcome appearance just as the flowers begin to open in late fall. As the mites feed on the undersides of the leaves, the foliage becomes “silvered” instead of the usual lustrous green. 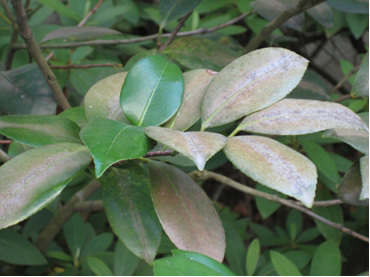 These damaged leaves will stay attached to the plants through the winter and impact the beauty of the Camellia plants. 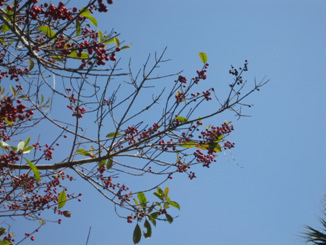 If left untreated, the plant will decline and branches will begin to dieback. Similar damage occurs on many types of hollies. The Savannah Holly pictured below has a very thin canopy and a heavy berry set (Very stressed trees will often produce more flowers and fruit than normal in an attempt to reproduce before dying). The mite damage caused the leaves to drop prematurely and led to some branch dieback. Without treatment of a miticide or horticultural oil, the tree may be completely killed by these tiny mites. Southern Red Mites feed by piercing the leaves and sucking the plant fluids. Those areas of the leaves collapse and can no longer produce chlorophyll for food. This causes the tree or shrub to lose vigor and decline. Plants with a heavy infestation of Southern Red Mites are more prone to diseases and insect borers. Once the mites have been managed, it is important to restore the plant’s vigor through supplemental nutrition. A specially-tailored organic program from Rawson Services includes macro/micronutrients and beneficial soil microbes. This fertilization treatment helps trees recover from insect and mite infestations. Natural fertilizer applications boost the immunity of the plant to help it recover from the infestation. A full canopy can be restored much more quickly with a good fertilization program.